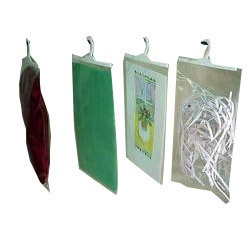 We are providing a wide assortment of Transparent PVC Bag. Owing to highly used by patrons, we offer this product in diverse patterns that meet on market demands. Founded in 2009, Super Enterprises has gained an admirable position in manufacturing and supplying of PVC Pouches and PVC Bags. These products are immensely well-liked owing to their heat resistance, water resistance, easy to use, low maintenance and low prices. Our products are developed employing the finest quality material and advanced techniques. These materials are attained from dependable dealers of market. In addition, in order to present the finest quality of products, we check them on different quality norms. In addition, our firm has knowledgeable professionals who give full support to achieve the business aims in proficient way. Besides, we follow current market trends in the making of our products.